Two act comedy about stereotypes and Black-Jewish relations. When Jewish housewife Beth discovers that her son David is dating a black woman, her fears and prejudices grow into a series of outlandish apparitions. When the real Nia comes to dinner, invasive neighbors and family revelations muddle Beth’s attempt to be a good hostess. 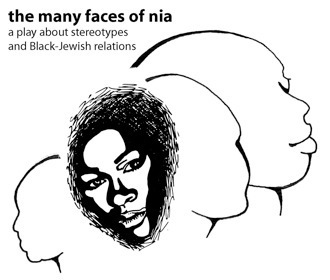 Set in Brooklyn in the early 1990s, The Many Faces of Nia combines snappy dialogue with magical realism for a laugh-out-loud tragedy about fantasy, stereotypes, sexuality, love and the tensions between Black and Jewish people. Two acts. 8 characters. 7 actors. 5 women. 2 men. OPEN Festival at the 14th Street Y. Presented by the Jewish Plays Project.